But for others, this time. In a short while I will reveal what has been going on in the background from before my family set their murderous sights on Fran. I will reveal how my “daughter”, for example, tried to stab a classmate while still in high school. And a horror story of alcoholism, homosexuality, murder planning in writing and quite possibly a new Nesset. These are dark waters. There are witnesses, and it’s not actually difficult to unravel. Yeah. Old title from a series of British humor. LinkedIN has become a world champion of the grotesque, the lunatic and the wannabe swindlers. We have a couple of screenshots for you today. Feel free to snicker uncontrollably :). Yes, boys and girls. 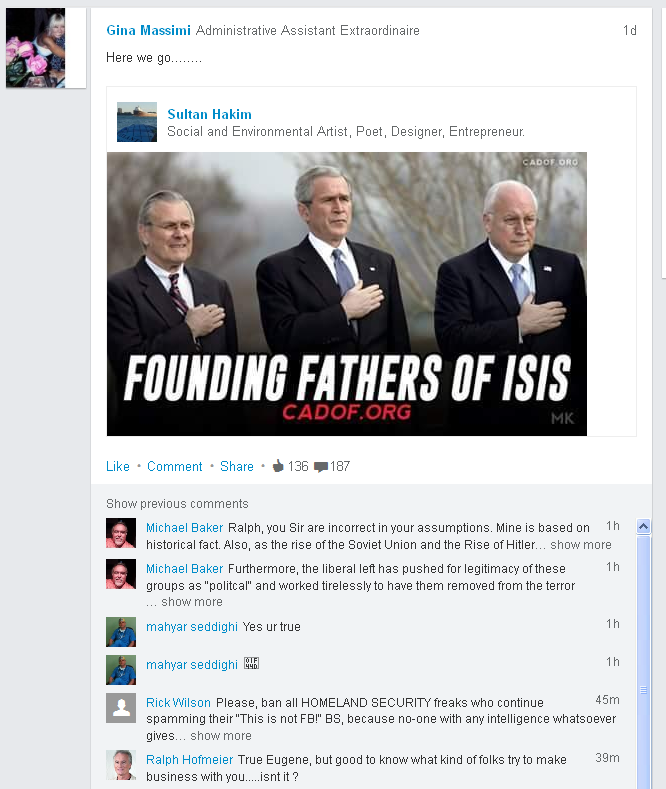 LinkedIN is one of the handful of major hate sites on the web, in many ways not distinguishable from Stormfront or any HAMAS or ISIS site. And the compeny does this intentionally, gleefully refusing to sanction Nazists or jihadists or communists never pausing murder incitement for a minute. It is, of course, also a site pushing Obama and Hillary, two bona fide murderous monsters, to the limit, and calling for extermination of the Jews. In fact, calling the site a Terrorist outlet is completely warranted and the owners should be arrested. Quick and as usual, dirty. The site has finally gone mad, and we have done a lot of homework awaiting the wreck. You know that I have pointed out the LI group Center For Intelligence Studies before, with its leadership teeming with classic antisemites qualifying for Stormfront membership. It would seem that the Hitlerist crowd now has moved in force to the group “Intelligence Community”. The old group went, as far as I can see, out of existence as we were putting some daylight on it. It seems I’m no longer a member of that group, but that LI is trying to hide that fact. When I look at it, I’m a member. When I try to reply to anyone, I’m not a member. That is one of two things: incompetence in LI, or malign criminality. I’m leaning to the last, because by now, there is no doubt whatsoever of LI’s racism, criminality, and support for those trying to overthrow the US Constitution. Fairly quickly, we will start listing all LI profiles falling into the bag (in our educated opinion) of Antisemite. Not the whole stupid things, of course. Lots of them are probably false; that is one of the biggest bits of LI. Just the names. 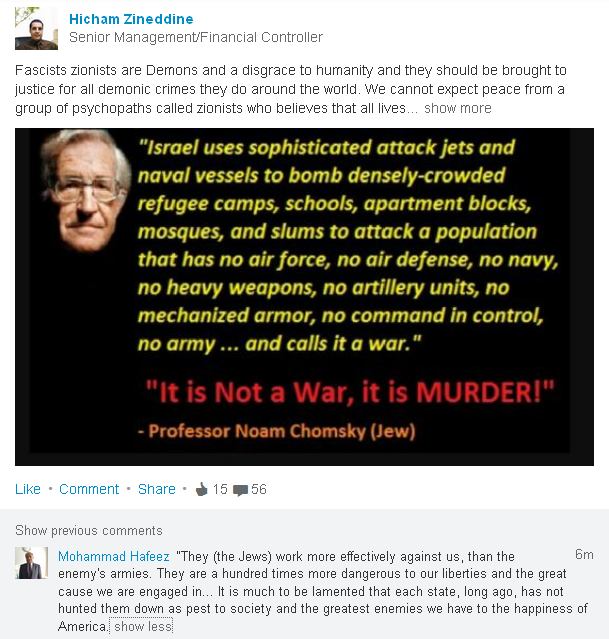 The Muslims, Nazists and leftists sway over LinkedIN is not abating in the slightest. 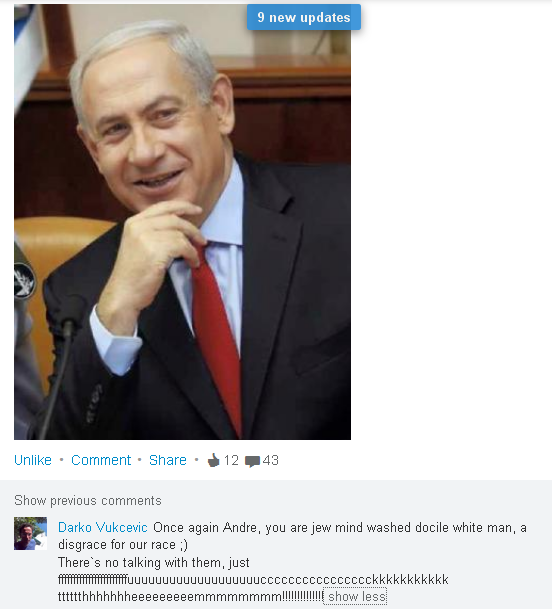 The sheer insanity leads me to conclude that LinkedIN is now, in actual fact, a straight up hate site in the grand tradition of Stormfront, HolyWar, DailyKOS and MondoWeiss and we’ll be listing it as such. I’d have expected LI admin to try curbing the worst of the outgrowths. I have received a suggestion as to why they’re not: that a number of islamists have been hired in admin positions, and so now are controllers. I don’t know if the suggestion is correct, but I have received the claim from more than one user. And it would explain a few things. It”s been some time since we made fun of Fascists on here, or as they sometimes like to call themselves in the US, “Facists”. What with ISIS, assorted islamic loony toons and far out cults approaching People’s Temple dive into terminal madness it’s easy to forget that there are actually just plain loons. Helmeted and uniformed, weird to watch (if you can sit through these Presidential campaign speeches for 2000 and 2004 without cracking a smile you have more self control than I have), but basically harmless. I give you Jack Grimes and the United Fascist Union. Or is that the United Facist Union? You decide :). You will note, however, that he seems to be made of wood. Maybe he’s Al Gore’s alter ego. UFU ran in 2000 and 2004. They were also running in 2008, but for some reason it never took off. The campaign site still exists, however, run by hiis Propaganda Minister. And girlfriend, if I remember. But it’s inactive. Oh, and note the pentagram. Jack seems to have had a bee in his helmet about some spiritual matters, but I don’t think I ever saw a full explanation. Funny stuff, word games. Free association can lead you in all kinds of pleasant and surprising directions. Or even unpleasant and shocking. Example: back in 1971 there was a novelist named Joy Chant who wrote a book titled “Red Moon and Black Mountain”. It was about all the standard stuff; a young wizard fighting entrenched evil, that sort of thing. If you wanted to do a little association trip and write a book about Barack Hussein Obama, you might title it “Black Clown and White House”. Now, people tend to think the president is an incredibly sharp knife, so much so that he has his very own little closet in the drawer. Where he does important and world-saving stuff like watching soaps (Mad Men, House MD), sports, and sorting his golf clubs. As luck (or maybe boredom) would have it, I have just been watching lots of “House MD”, evilly squirreled away on VHS tapes. And the strange thing is that Obama bin Fraud seems to have been extraordinarily obsessed with this TV-series. So much so that he hired one of the actors (Kal Penn, who plays Dr. Kuttner and is tragically killed when he needed to leave the series to go hold Mr. Obama’s hand. Dr. Kuttner has a competitor in the series, Dr. Taub. Dr. Taub is a Jew, and is not well liked by the series title figure who is a tortured genius obsessed with saving the world and being right. And even more importantly, proving everyone else, particularly the Jew, wrong. So it would seem that El Presidente has a soft spot for the tortured savior. Which leads us to the joke. Sort of. Maybe there’s even jokes inside jokes here. House may be portrayed as a genius in the series, but for people who know (and remember), the actor who plays House is perhaps more known as Bertie Wooster, the slack-jawed upper-crust village idiot who is a member of the Drone Club and a puppet of his manservant Jeeves. So who or what is Jeeves in the White Household? And is he/she/it having fun? Lol. I know I am. Are you?